JANUARY 12, 2015, NEW YORK, NY – The Manhattan office leasing market continues to heat up, with new leases comprising more than 60% of total leased space in 2014, according to new research from CompStak , the commercial real estate market intelligence solution chosen by leading institutional investors, lenders and owners nationwide. No market has felt the impact of growing leasing activity more than Midtown South. That market led the charge with the highest 2014 effective rent growth rate in the city, 14.2%. This marks the third consecutive year of double-digit growth for the Midtown South market. Average Effective Rents in Midtown South have now surpassed $60 per square foot. With Midtown South rents climbing toward Midtown’s average effective rent of approximately $64 per square foot, the landscape of tenants, is changing. Many TAMI (Technology, Advertising, Media & Information) tenants are migrating Downtown in search of lower rents and larger spaces. At the end of 2014, TAMI tenants comprised more than 40% of all leases Downtown, up from approximately 30% five years ago. “The increase in new leases signed, combined with a migration of TAMI tenants Downtown, is a terrific signal of both a growing market, and a stable one,” said Michael Mandel, CEO of CompStak. “A more diverse tenant mix throughout Manhattan, and the take up of new spaces in both old and new buildings protects the Manhattan office market against a future downturn in any particular industry sector. 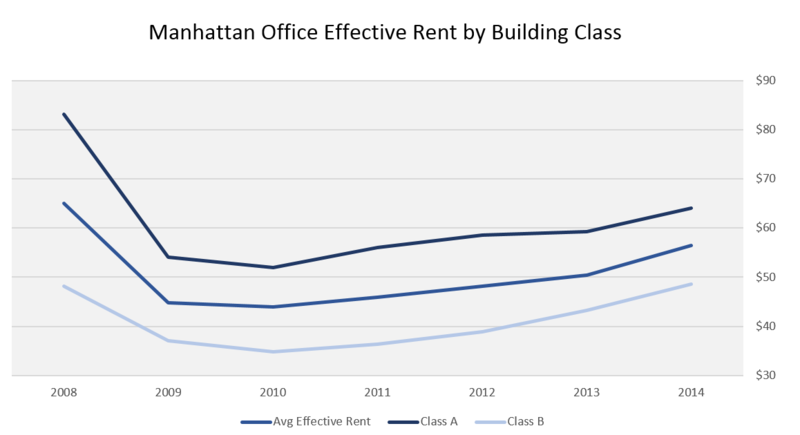 Across the board, Manhattan effective rents have regained about half of the ground they lost in the downturn, ending the year at $59 per square foot, up from a low in 2009 of $45. Submarkets with high inventory of class B buildings, such as Penn Station, Time Square and Midtown South, were among the biggest winners. For more information about this research or about CompStak’s commercial lease records and analytics, visit www.CompStak.com</a href>. About CompStak CompStak is the world’s first comprehensive database of commercial lease comparable data. We gather our data from our users, a committed community of commercial real estate brokers, appraisers and researchers. Our analysts review all of the data we receive to ensure data integrity and quality.